Kristen TenDyke's Blog: I'm featured in Interweave Knits, Winter 2012! 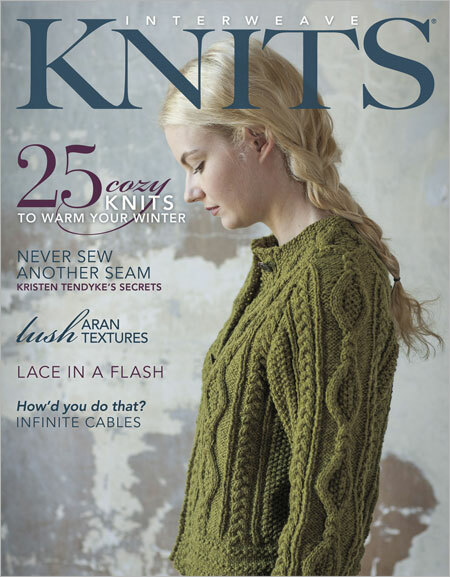 About a month (or two) ago, Eunny Jang—editor of Interweave Knits—contacted be about being interviewed for their winter issue. The first time I read the e-mail from Eunny part of me was terrified. That happens sometimes when something just seems a little too big and overwhelming to think about… But, it didn't take too long for me to shift into feeling flattered and excited about the whole thing. When interview day came I was nervous, and didn't know what we'd talk about or what I might say… But, when the phone rang and I began speaking with Spike, everything went smoothly. It was like talking with an old friend. I felt open and honest and just said whatever came to mind. I still haven't gotten a copy of the Winter 2012 issue, so I haven't read the article yet… but, I've been hearing about it from friends and folks on Twitter. I'm haunting the mailbox and searching through local stores to find a copy (or two) so I can read what was written. I may break down and order it online, or get myself a digital copy! I just finished reading the article and I really enjoyed it. I especially appreciate your intuitive style...it's a great way to design! Chalkthe article up to another 'kismet' step to your burgeoning career. Well done!